When I first saw the pic, I asked myself who would had made this piece of heaven. So it was you, Veronica! This pie looks so scrumptious… It is like having both banana pudding and pie at once. The only thing that I want is digging my fork in it!!! I love pies like this! I am so glad you got me :) and that you made this pie. It is one of my favorites! I may just have to try this…I think I would swap out the topping for chocolate whipped cream though! This pie look amazing and tempting Veronica!! (and I love Joshua´s pictures aww he is cute! A nutter butter crust. What a GREAT idea. This pie looks delicious. 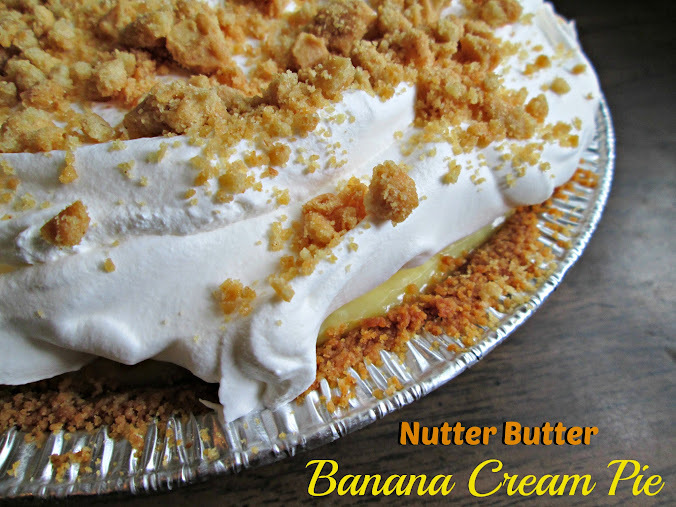 Banana cream pie is one of my favorites! The nutter butter version sounds even better. Will have to try this next time. Okay my mouth is officially water! Looks supreme. Glad to be part of SRC group C with you! I adore nutter butters and why didn’t I think to make a crust out of them? This is a genius pie! What about a chocolate pie with this crust? Custard pie? What about…..wait for it….a peanut butter pie. Great, now I will not be able to sleep b/c I will be dreaming about all these combinations! You had me at Nutter Butter….then you added Banana….wow, wow, wow! Just awesome. Thank you for choosing THIS pie for SRC! And Nutter Butters are new to me but I want to try them now! Holy cow – does that look insulin worthy or what??!! I love the idea of using nutter butters for the crust – genius! my grandpa looove banana cream pie. this looks incredible! will have to make it soon.